Written by: Mohan Pandey. Self-Published: 2010. 242 + x pages. Product development (i.e. innovation) has undergone many paradigm shifts over the years. I recall when I first started attending the PDMA conferences over 20+ years ago, many of the sessions focused only on product innovations. Later, that expanded to both products and services. Since then, many other facets of innovation have entered into the discussions at the PDMA conferences. Robert Wolcott, Ph.D. (Co-Director of the Kellogg Innovation Network and Professor at the Kellogg School of Management – Northwestern University) has discussed extensively that innovation should be evaluated over multiple facets/dimensions beyond the normal discussion on products and services (Sawhney, et al 2006). And he observed that companies who are able to creatively innovate beyond the “standard” dimensions of innovation are often the most successful financially. In Pandey’s book, we are able to see how Boeing was able to innovate, beyond the “standard” dimensions of innovation (in the arcane world of aviation regulatory/compliance standards) in order to be successful in the commercial long-distance airline market segment. How well he explained that innovation to the general reader is the crux of my review of his book. When I saw the initial title of Pandey’s book, I assumed, somewhat erroneously, that Pandey would provide a broad framework on the Boeing vs Airbus competition that has been going on for over 40+ years. However, as I delved into reading the book, it became clear that the majority of the discussion of this book would be on a specific product category of competition, i.e. the Boeing 777 versus the Airbus A330/A340 on the long-range commercial air travel segment. While there is some mention of the Boeing 737 product line (Boeing’s most popular airplane) and the Boeing 787 Dreamliner product line (whose commercialization problems have been clearly documented in the media for several years), Pandey seemingly gave short shrift to those major Boeing commercial airplane product categories and their Airbus competitors to focus, for the majority of his book, on the Boeing 777 versus Airbus A330/A340 competition. Specifically, this focus centered on the regulatory, compliance, safety discussions and political concerns as they focused on ETOPS (extended-range operation with twin-engine airplanes) for the Boeing 777. The Boeing 777 is a twin-engine commercial jet plane capable of extended commercial flight range (est. 14,000 km – 17,000 km). To be succinct, the controversy on the Boeing 777 was that previous to its commercialization, most overseas commercial flights were either using tri-engine (McDonnell Douglas DC-10, Lockheed L1011) or quad-engine (Boeing 707, 747) configurations and Airbus was leading the charge on whether one could use a twin-engine jet plane (i.e. the Boeing 777), and fly it commercially overseas without adversely impacting the risk of passenger safety. Pandey was involved heavily in this controversy from the Boeing side as he was a senior management official trying to convince the many different constituents (customers, politicians, regulatory officials, etc.) on the safety and reliability of the Boeing 777 so that they would grant ETOPS clearance for the Boeing 777 to fly commercially overseas from its inaugural commercial launch in the many commercial air travel segments where it competed directly against the Airbus A330/A340. 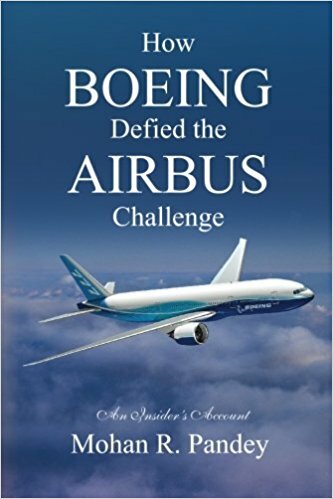 Pandey’s multiple chapter discussion on this ETOPS controversy between Boeing and Airbus and his involvement in that controversy was, at times, fascinating, provocative and sometimes difficult to comprehend. The discussion was both fascinating and provocative because it gives the reader a glimpse into the inner workings of how aviation regulatory standards are actually promulgated, a part of aviation innovation that is rarely ever discussed within or outside of that industry which is, however, a shame. In other industries besides aviation, compliance/regulatory standards/requirements are often key dimensional drivers on whether innovations are successful. Examples include such industry segments as the auto industry (CAFE standards, tax credits), the biomedical industry (FDA approvals, Medicare reimbursements) and the utility industry (EPA standards, carbon credits). These areas have probably been covered in more detail in the past than the aviation regulatory standards arena. On the other hand, there were sections of the regulatory/compliance discussion in Pandey’s book where I think Pandey went overboard in his use of aviation jargon, arcane definitions, and obscure acronyms that obfuscated what he was trying to explain to the reader which was also a shame since a clearer explanation of these regulatory standards issues and their potential impact to the general public would also have been helpful to a general reader of this book. The biggest concern I had, however, still existed when I completed reading Pandey’s book, which is one of subjective bias. Pandey had worked for Boeing for over 35 years. He is a great fan and is very loyal to his company, and he obviously wants to impress the reader on how he helped Boeing succeed against Airbus in at least one category of commercial air travel. However, in even the ETOPS discussion, where he seems to be an expert, I was troubled that I was being given too much of a one-sided story from the Boeing perspective without the chance of any rebuttal from the Airbus side on this competition, which I think would have been just as interesting to hear as the Pandey/Boeing side of the story. So, if you are someone who has a deep interest in the actual workings of the aviation industry or who is interested in an area of aviation innovation that has long been overlooked (regulatory standards), then I believe you would enjoy reading Mohan Pandey’s book How Boeing Defied the Airbus Challenge: An Insider’s Account. However, if you are more of a general book reader, like some people I know, and would prefer a more objective discussion on this competition, I cannot, in good conscience, recommend this book to you.